Michael Connelly, best-selling author and the creator of Bosch, talks with TV Time Machine radio host Jim Benson about his hit Amazon series based on his iconic homicide detective character Bosch, whose second season is available for streaming on Amazon Prime Video. In this audio edition of the TV Time Machine, we welcome Michael Connelly, creator and Executive Producer of Bosch. 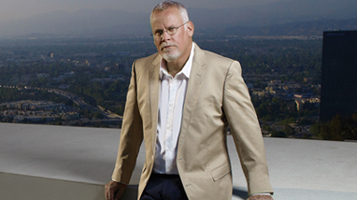 Mr. Connelly is one America’s Best-Selling Crime novelists, and is author of over 28 books, including Blood Work, The Drop, and The Lincoln Lawyer. Over the next audio segment, Michael Connelly talks about Bosch, the hit series based on his iconic homicide detective, whose second season is now available on Amazon Prime Video. Again, for those of you intrepid enough to dig up a few clues, feel free to throw us a bone, as we give our last rites to the past, so we can read you your rights, in the present!